Develop your students' comprehension skills with this fantastic FREE close reading set! 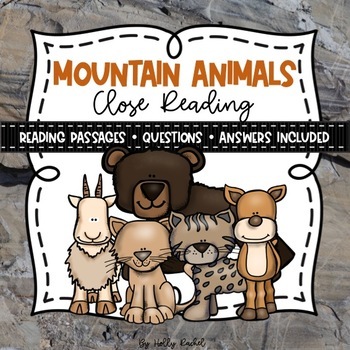 Included are five non-fiction original reading passages based on five mountain animals. Alongside each reading passage are questions to develop student comprehension, understanding and information retrieval. Also included are five answer sheets, one for each passage and set of questions. The reading passages can be used in a guided group session or during independent reading activities. The five reading passages are each based on a particular mountain animal. These are: lynx, mountain goats, brown bears, mountain lions and deer. Download the preview for an example of one of the reading passages and comprehension questions. Alongside the US spelling version, alternative UK spelling versions are also included.